The Linton i1 group exists in Somerset to the south and to the east of the much flooded Somerset Levels. The group is characterised by a series of mutations 459=9-9 464d=17 460=11 Gata H4=9 607=13. 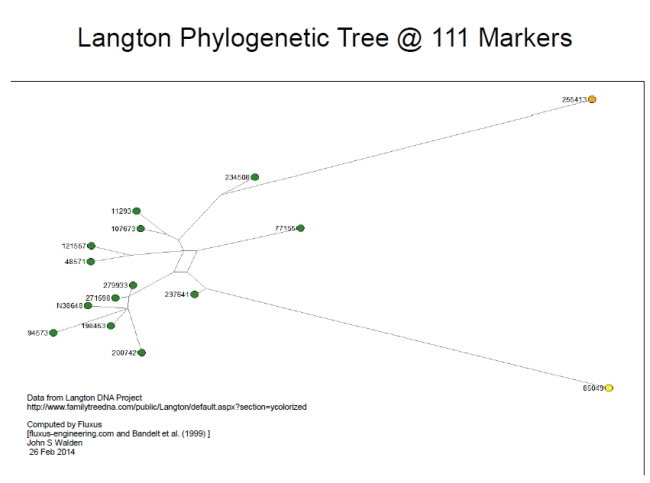 On the phylogenetic trees below the group clusters together away from everyone else. At 111 markers Newport and Nelson seem to have mutated slightly away from the others but clearly belong to the group. One Perkins is seemingly more closely related to the Pikes than other Perkins. Ward is an assumed name from a Pike-Warre marriage probably to acquire property. The far flung Newberry and Moon are not particularly closely related to the core group. 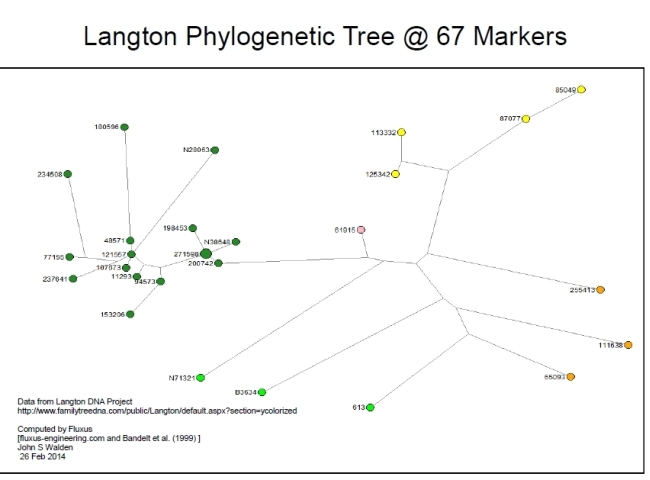 The 67 marker tree again reflects some further mutations in Pounds (Pointz) Magee and Newport. What is very interesting is that those who shared some but not all the mutations (with one exception) are not particularly closely related. These other i1 sequences begin to form a typical ring which is rudely broken by the 459=9-9 group. Self reporting by this group reveals them to be largely in the south of England including Gloucestershire and Sussex. None of them are particularly close except Perry and Howington. The later name may derive from either east and West Horrington near Shepton Mallet or a similarly named place Hollington near Hastings Sussex. Moon is also not far away from these two.